• Growth & Spread: Medium grower. With a height of 0.25 to 0.33 m and spread of about 0.6 to 0.8 m.
• Characteristics: An elongated leave with a central white streak and scarlet red/purple racemes or stalks. 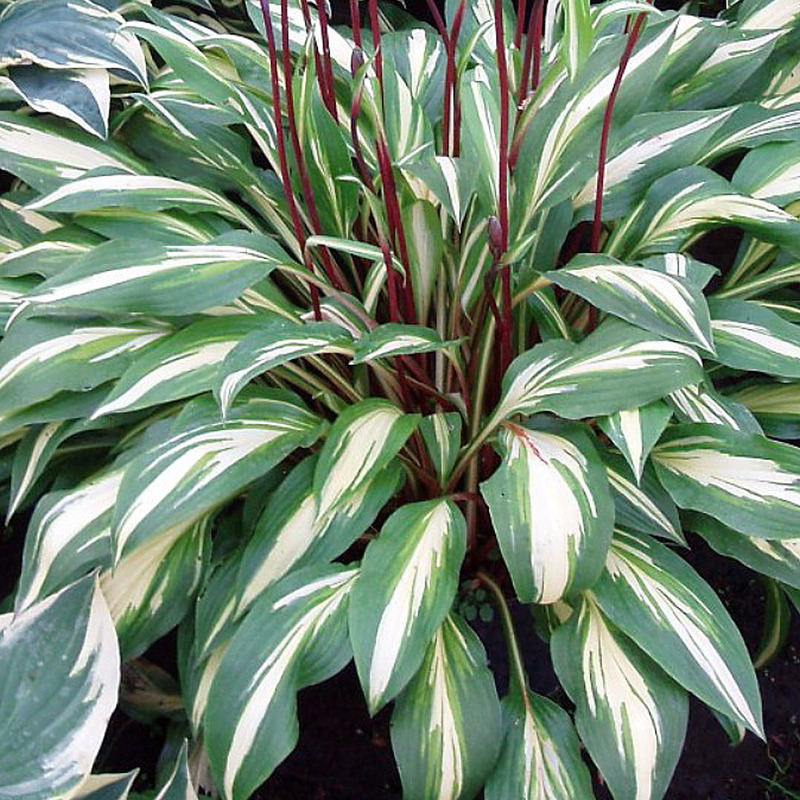 The striking features of this hosta include the “Cherry Berry” colors that accent the plant on the leaf stems and are even more apparent on the flower stalks. The lanceolate-style leaves carry a central white streak with brilliant green margins. The flowers are brought skyward by brilliant purplish-red stalks and help justifies the plant’s name. The flowers themselves are of a trumpet shape and have a soft lilac or lavender-coloured hue. These plants grow from a central clump and the leaves spread out to provide a dense, shaded groundcover. Because of this, they are very good to use in border areas to control weed growth. Hostas can be divided every two to four years in order to thin or transplant. Dividing the plants helps to encourage more vigorous growth and allows the plants an appropriate amount of space to fully develop. They are relatively disease-free. However, slugs and snails are pests that are attracted to the plants and also appreciate the groundcover hostas offer. A suggested organic method to deal with these pests, is to this is spray a nematoid-filled solution on the soil around the hostas. These worm-like creatures will organically dispose of these pests.